LeptiBurn is an innovative product aimed to act as a complement to a rigorous diet and exercise program In order to achieve better weight loss. Unlike the commonly found products, LeptiBurn focuses on Leptin modulation. Leptin is in charge of the satiation feeling, and in high concentrations reduces appetite. 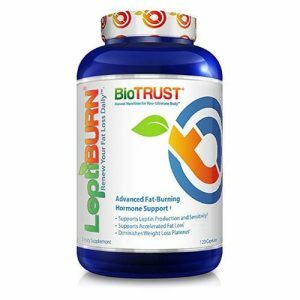 LeptiBurn is manufactured by BioTrust Nutrition, a company established in 2012 in Aurora, Colorado, USA. BioTrust is a company focused on the production of vitamins, food supplements and diet programs that aim to improve brain function, boost metabolism, manage weight or act as exercise supplements for both amateur and professional athletes. For advice and additional information about this supplement or helpful tips, you can contact the manufacturing company directly at the following phone number: 1-800-766-5086. LeptiBurn contains the following ingredients: Green Tea leaf extract, Irvingia Gabonensis seed extract (IGOB131®), Griffonia Simplicifolia seed extract (5-Hydroxytryptophan), Aframomum melegueta seed. Other ingredients: gelatin, magnesium stearate, rice flour, silicon dioxide. LeptiBurn is a nutritional supplement that aims to boost weight loss. It comes in a 120 capsule bottle and it is recommended to be taken two times a day with two capsules before breakfast and two before lunch. LeptiBurn modulates Leptin activity and bio-ability. Leptin modulates the metabolism of fat and regularly is bio-ability is reduced in people that decrease their caloric intake or are on a diet. This is processed by the brain as a starvation state. LeptiBurn reverses this natural tendency, helping your brain leave this starvation mode. Leaving this starvation mode reduces your appetite; if you eat less you achieve your weight loss goals easier while your fat metabolism is increased due to the high leptin levels. How Much Does LeptiBurn Cost? LeptiBurn is expensive compared to other similar nutritional supplements. No evidence of LeptiBurn side effects can be found on the web. Ingredients inside LeptiBurn are generally safe and there is a low chance of experiencing side effects after consumption. LeptiBurn can be ordered online from different places but our recommendation is to either buy it directly from the manufacturer or purchase it from trusted online retailers which may offer you discounts. We did a research on other products from BioTrust Nutrition. Here is a complete list.